Good acoustics, meaning less stress due to noise, is of major importance not only in offices, homes and public buildings. For air conditioning in buildings, however, it is not only acoustically hard materials that contribute to poor and echoey room acoustics; non-optimized ventilation components also have a detrimental effect. In practice it is thus frequently the case that during planning of ventilation systems a noise increase resulting from the installation situation of the ventilation components is not taken into account. In these cases, meaningful lab tests can ensure, even before implementation, that acoustic requirements are met even in the specific installation situation. Whether it’s an individual component or a complete system – in our modern echo chamber we test and optimise quantities such as the sound level, damping properties, volumetric flow and pressure loss, professionally and effectively. For optimum acoustic comfort. In production processes too, noise avoidance is important. For example, disturbing noise can be a crucial competitive aspect when a machine is operated. The causes of this are often not trivial. The acoustic pressure level of a machine is not based on the sum of the sound levels of its individual components, but is the result of the complex interaction between air routing, homogeneity of the flow profiles, operating point of the fan or turbulences in the inflow. LTG’s engineers are the right people to speak to in all acoustic problems in existing systems. 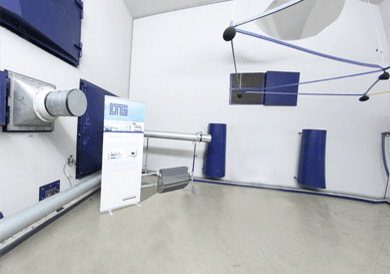 We measure on the spot, directly in the production facility, or we test the components in question in our echo chamber, then improving acoustic comfort by experimental modification of components, flow paths or other influences. For optimum processes and products.